My husband is not a big pasta eater. And by not big, I mean, he hardly touches the stuff. He likes macaroni and cheese and he’ll eat lasagna. But, in general, he doesn’t care for most dishes with pasta in them. And this is hard for me because I love everything about pasta and pasta dishes. You can do so much with it and it is a very affordable ingredient. And it’s filling! So, over the years, I’ve worked hard to get him to enjoy eating it more…not with much success. However, Gene always talked about his Grandma’s goulash. He had no idea how she made it but he had good memories of it and it has pasta in it so I have tried several variations of it in our 20 years together. None of those recipes really quite measured up…until this one. And that’s when I realized I was taking a very simple and humble recipe and making it much more complicated than it needed to be. This recipe is simple and guess what? Gene said this tastes just like what his Grandma made. Note: This is not a traditional Hungarian Goulash. We’ll just call it an American Goulash but it’s what his Grandma made and called goulash. It goes by a lot of names. 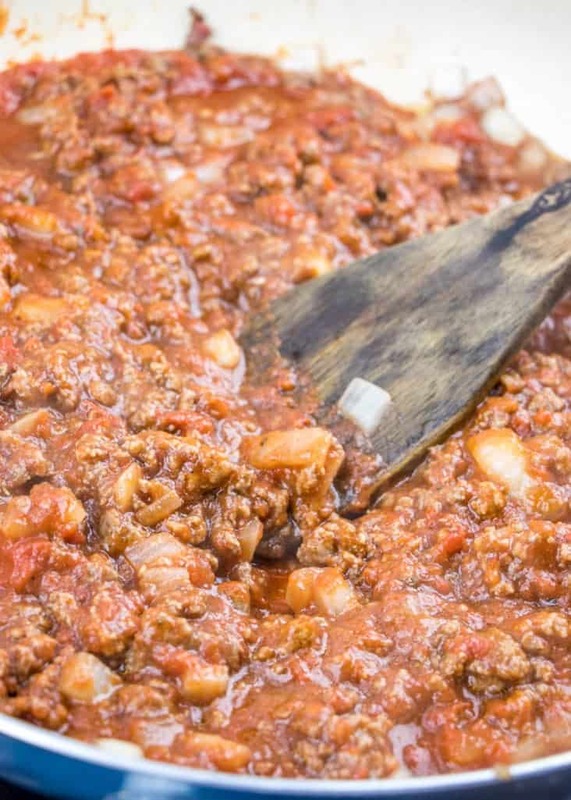 Over the years I have heard folks call it American Chop Suey, Johnny Marzetti or Slumgullion. I suppose it depends on where you’re from. Feel free to use whatever pasta shape you have on hand and throw in whatever veggies your family loves. Hope you’ll enjoy it! Note: Please add in additional veggies your family enjoys! Green peppers, diced tomatoes or mushrooms would all be great additions. In a large saucepan over medium heat, brown beef along with onion and garlic. Drain excess grease. Stir in tomatoes (with juices) and tomato sauce. Season with sugar, Italian seasoning and salt and pepper. Stir well and bring to a boil. Reduce heat and simmer for about 10 minutes. Then add in cooked pasta and stir. Allow to simmer for another 5 minutes. Sprinkle with a little grated Parmesan cheese. 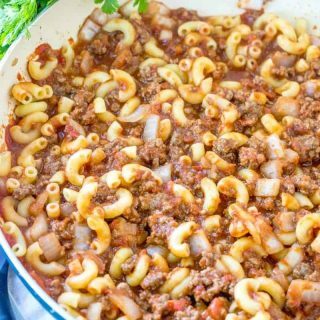 This American version of Goulash is pure comfort food made all in one pot. 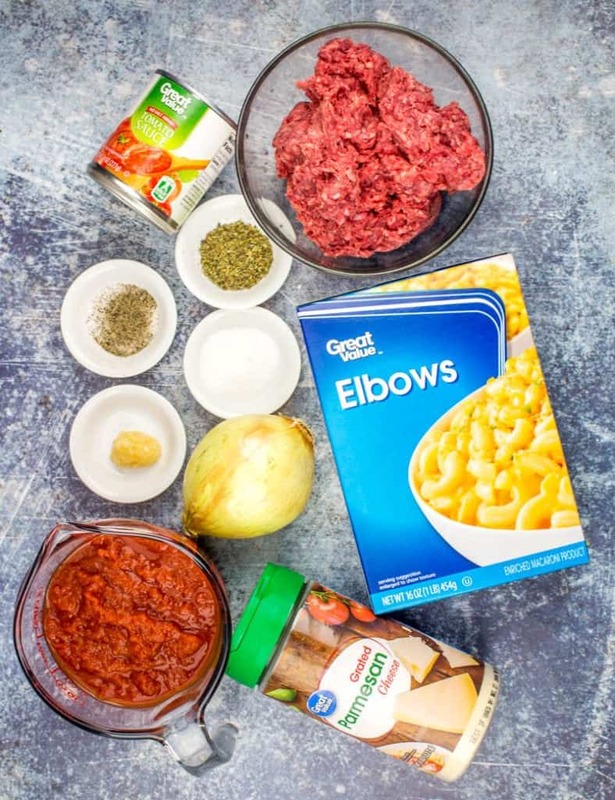 Made with simple ingredients: ground beef, canned tomatoes, and macaroni noodles. In a large saucepan, over medium heat, brown beef along with onion and garlic. Stir in tomatoes (with juices) and tomato sauce. Season with sugar, Italian seasoning and salt and pepper. Allow to simmer for another 5 minutes then serve. Please add in additional veggies your family enjoys! Green peppers, diced tomatoes or mushrooms would all be great additions. Looking for more comfort food recipes like this one? Be sure to check these out! reading these comments really brought up memories from my childhood. We were born in south, lived in north for 16 years and then some of us migrated back down south.My mom was a stay at home mother of five so she and my dad stretched groceries to feed seven on their budget. my mom also called this goulash. She however did not use the sugar, cheese, or Italian seasoning(this made it Italian instead of goulash). She did add some grn pepper and 1 TBsp ketchup for sweetness. My dad also cooked- about 8 times a year and he is the one that introduced us to SLUM GULLY (as he called it). He had my mom cook a very large chuck roast in the Yankey pot roast style with onions, carrots, potatoes in gravy. The next day he would take left overs and chop the veggies and meat. He then put this in a large pot and added assorted vegtables. Lima beans, onion, corn, English peas, ect. cooked until vegies were done. this was very thick. He served it over egg noodles. 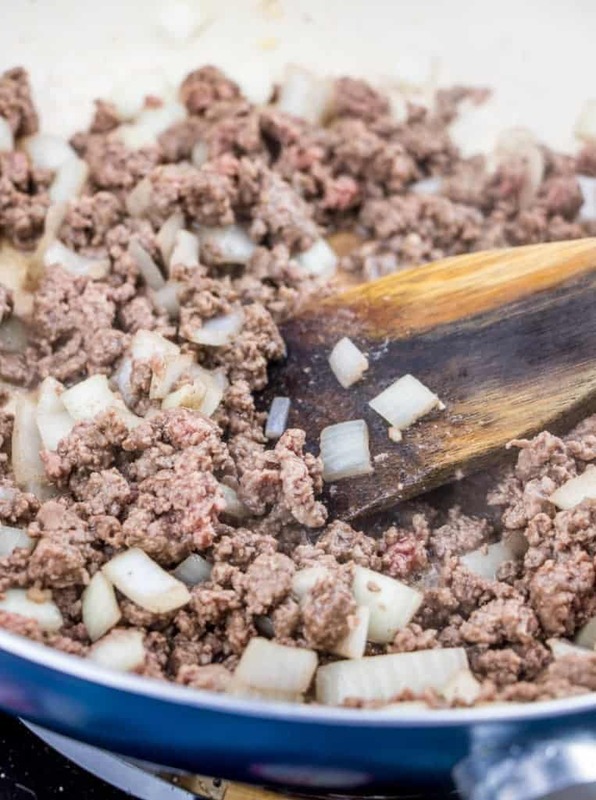 His version of American Chop Suey was sliced strips of pork marinated over night in soy sauce, worstershire sauce, sesame oil, and sugar.The next day in a large stock pot he would pour in some beef stock and chicken stock. (we didn't have pork stock and this worked fine). he then rough chopped some onion, celery, broccoli, water chestnuts, bamboo slices, carrots, Chinese bean sprouts, and sliced about 1/2 small cabbage and simmered all while in a skillet he cooked the pork. then he added pork to stock pot with the marinade, thickened the sauce and when it was done, he served it over rice. this was very good and I've never had in a restaurant but this was his chop suey, not a tomato based pasta. Just telling our version of the dishes. Barefootingal. Just ran across your blog. I have to laugh. Your recipe is almost identical to mine, I just add a little chili powder (no more than a teaspoon) and corn. It's my husband's favorite all time food. There's a big pot of it in the fridge at the moment so he can "graze" (his term, not mine) when the mood strikes. Still giggling! My mother used this same basic recipe. On spaghetti night, we had it on spaghetti noodles. If she added the macaroni – always elbow because we didn't know about all these other types -, she called it raviola. If she put cut-up potatoes in it, she called it goulash. Amazing how different each tastes. My hubby's favorite is with potatoes. I bet your husband would like it too. Just cut the potatoes in chunks and boil them till they are partially done, getting rid of much of the starch. Then add them to the meat-tomato mixture and let it simmer till the potatoes are done. They will soak up the juice…and as my hubby says, "It is so good you can't sit still and eat it." I grew up in western NY and we called it goulash, too. My mother made it with tomato paste and sauce – she didn't like tomatoes. I can't make a large enough pot of this for my husband. Anything with tomato sauce and he's there. Me, too! I live in the south and Goulash here the pasta is not cooked separately it's all cooked together and there is soy sauce added & sometimes worcestershire sauce is added as well. Most of the time sugar too and its always elbow noodles. My mother used to call this dish, "Glop". She was from the Berwyn area of PA, so I don't know if that's what they called it there. It's still "Glop" to me and my family in CT.
Love this stuff – my Mom (originally from Kansas) called it "Slum Goo". She did something a bit different and stirred in a can of condensed cream of mushroom soup and then topped it with sharp Cheddar cheese. YUM! 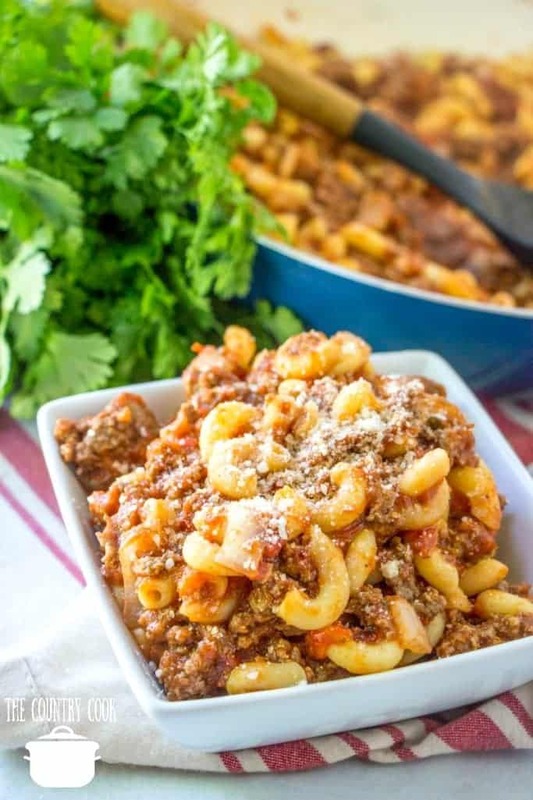 Happened to come across this recipe when searching for goulash recipes and decided to try it since it it looked so easy to make and I had all the ingredients at home. I didn't deviate at all from this recipe and it tasted Delicious with a capital D. My husband couldn't get enough. Thank you for this great recipe!!! Glad it was hubby approved! Hope it becomes a regular recipe in your rotation. My best guess is variations of this recipe were a result of rationing during WWII. My mother’s goulash was very similar but she used elbow macaroni and seasoned with salt, pepper, a little garlic salt, a little sugar. She also added chopped celery. I remember there was always a pan of corn bread made to go with goulash. Delicious! Comfort food! Wonderful memories of growing up in the Midwest. Thank you for publishing. I bet you are right Sue! So many of the recipes that we have today are variations on recipes during the war! 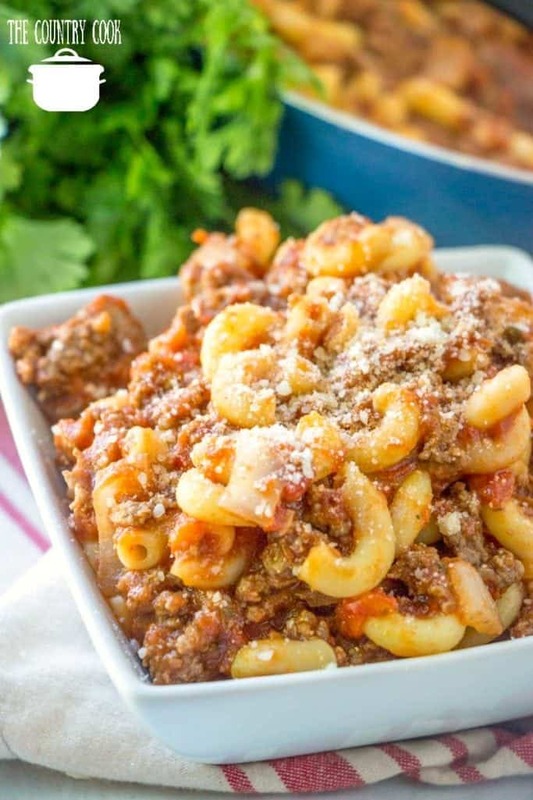 My grade school would serve Goulash back in the 1960s……Always looked forward to lunch when it was served…of course in those days .the schools actually hired cooks that prepared the food each day……..was probably a lot better then today…. they used government cheese back then also….our school still has cooks….when I was young they served what they called Marietta….wide noodles, hamburger, crushed tomatoes and mozzarella cheese….it was delish!!! I asked one of the ladies when I got out of school for the recipe….she gave it to me but laughed and said it was hard to cut a recipe down that much but she tried…..it is one of my kids favs!! 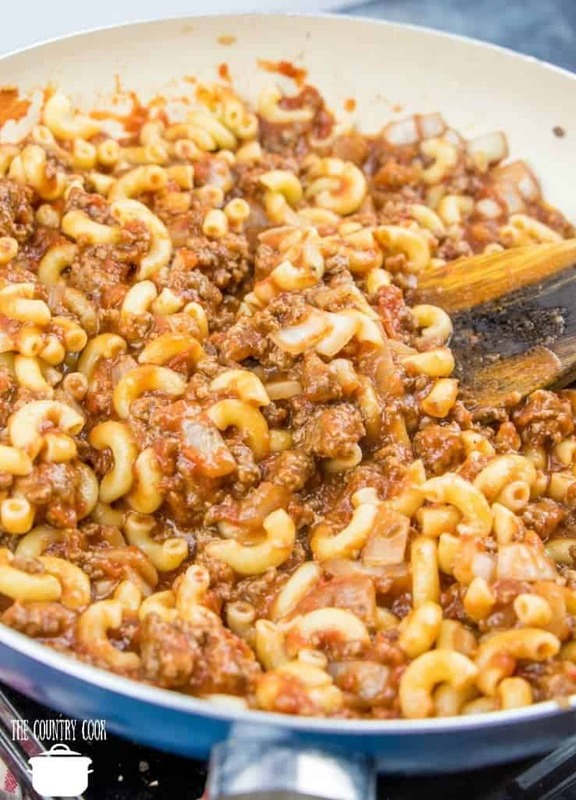 My Mom and Grandma also fixed goulash similar to this….and they left out the hamburger on another version….it was macaroni and tomatoes….always home canned tomatoes…crushed and macaroni….still love it…..I think my Grandma put garlic in just about everything she cooked….she lived to 89. I’m from a family of 12 children. My mom called it Johnny marzetti. She used elbow mac, green peppers, onions, celery, stewed tomatoes and tomato sauce with lots of pepper and salt. I made your recipe today and my children and grandchildren loved it! I added cheese and baked it. I’m going to try Italian sausage th is time with the beef. Sounds delicious! Thanks for all the ideas! Love it Sue! And I really like the idea of putting it in the oven with some cheese on top. YUM! Man, this stuff looks good enough to eat! Gonna have try it. 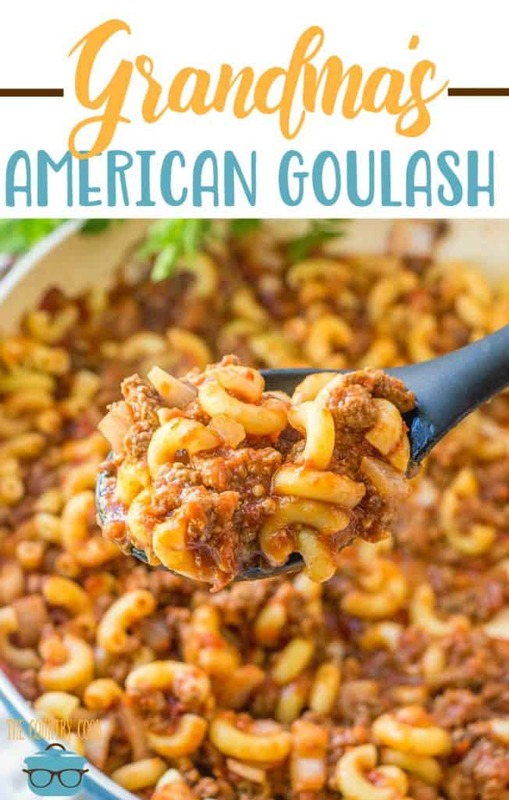 I believe “American Goulash” was the result of making do with what you could buy with ration stamps during WWII. My mother’s version didn’t call for italian seasoning but salt, pepper, garlic powder, onions, CELERY, tomatoes, elbow macaroni, ground beef. A little sugar. Again notice the small amount of sugar — rationing. This was not only good during WWII but mom frequently made it because it was cheap to make — and filled us up. A real budget stretcher. My mom always made corn bread to serve with it. And of course there would always be jello (with whatever she had on hand in it) and dessert. Usually pie. My mother baked something every day — pie, cake, cookies or made rice pudding or bread pudding. I grew up in Nebraska for point of reference. I grew up eating this! My Mama always called it “Slum Gullion””. LOL! It usually consisted elbow macaroni because that’s what my Dad prefered and whatever she had left over in the refrigerator and she always made this just before my Dad got paid. A lot of folks now days would turn their noses up at having to eat this , but back in the day, it was very filling and always good and you didn’t get away with saying, “I don’t like this.” You ate whatever was put before you and was glad to get a hot filling meal. My mother made a version of this and it was delicious. Mom often added celery but I don’t remember italian seasoning or cheese. Comfort food from my past. Thanks for sharing. I suspect this is a recipe that was invented during WWII during rationing. If I didn’t have such picky eaters, I would totally add celery. I love it!! My mom made this often when we were going up. However she would put stewed tomatoes in it with tomato sauce. We loved it and it was a comforting food. I still make it today and my children and grandchildren love it. I have made this recipe at least 20 times if not more so thank you! This makes me so happy to read! Thanks Kate!! 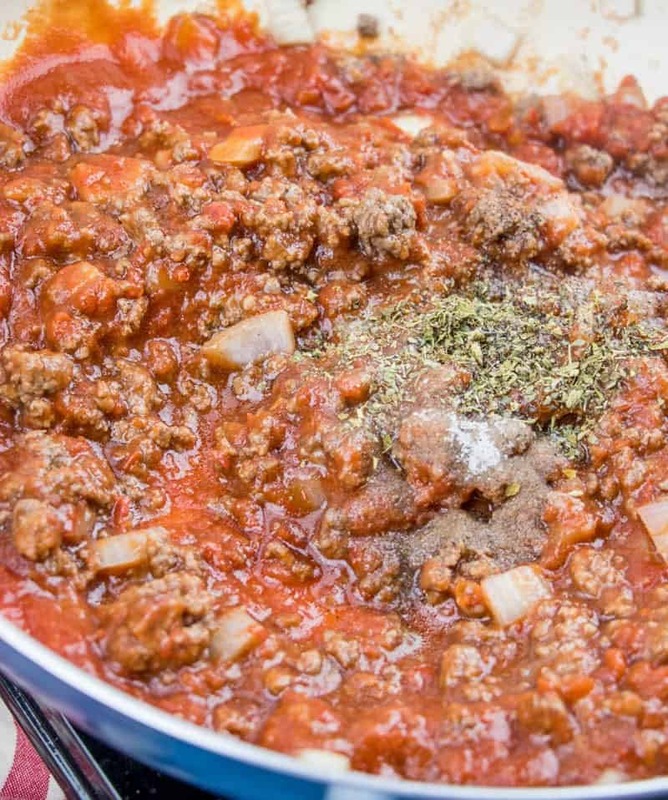 Can the sauce be prepared & frozen (without the pasta)? Plus can fire roasted tomatoes be substituted for the regular crushed tomatoes? Yes and you can use any sauce or tomatoes you prefer. This is exactly how my grandmother and mom made their goulash. I never even knew there was other goulash until I went to Europe in the 80’s, lol. This was a taste of home, thanks for the recipe.